The word ‘freedom’ was very much in the air when 22-year-old Martin Luther King, Jr., settled into his St. Botolph Street apartment to begin graduate studies at Boston University. A newspaper columnist had campaigned for Boston to create a path following the footsteps of John Adams, Paul Revere and Sam Adams. Mayor John Hynes acquiesced, and the Freedom Trail was created in June of 1951. It was an instant success. Fourteen years later and a month after leading the Selma marches, Dr. Martin Luther King, Jr., forged his own freedom trail in Boston. 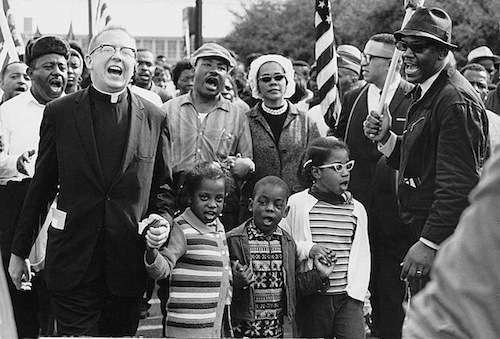 He led 22,000 civil rights marchers from a playground in Roxbury down Columbus Avenue to the Boston Common. Martin Luther King considered Boston his second home. He was the son of a well-to-do Atlanta minister. During his three years at BU, Boston to him was a genteel city of concerts and teas, sermons and classes, tailored suits and highbrow discussions about Gandhi and Spinoza. He owned his own Chevrolet, wore tailored suits and consulted renowned philosophers Paul Tillich and Reinold Neibuhr for advice about his dissertation. King lived in the multiracial South End, where he developed the studied air of an intellectual. He wooed Coretta Scott, an Antioch College graduate who was studying to become a classical singer at the New England Conservatory of Music. He treated her to concerts and the theater and showered her with poetic prose. At Boston University he was influenced by his advisor, theologian Howard Thurman, the first black dean of a predominately white university. Thurman, who had visited Mohandas Gandhi in India, educated his young student in the mahatma’s philosophy of nonviolent civil disobedience. Our nation in a sense came into being through a massive act of civil disobedience, for the Boston Tea Party was nothing but a massive act of civil disobedience. 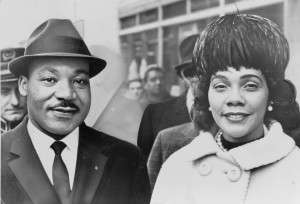 One month after Martin Luther King led the voting rights marches from Selma to Montgomery, he made one of his many visits to Boston. He landed at Logan Airport on April 22, 1965, and sped toward City Hall and then the Statehouse, where he addressed a joint session of the Massachusetts General Court. He told them segregation must die if democracy is to live. He spoke through a bullhorn at the Patrick T. Campbell Middle School. "This is not a battle of white people against black people,” he said. “It is a struggle between the forces of justice and injustice." 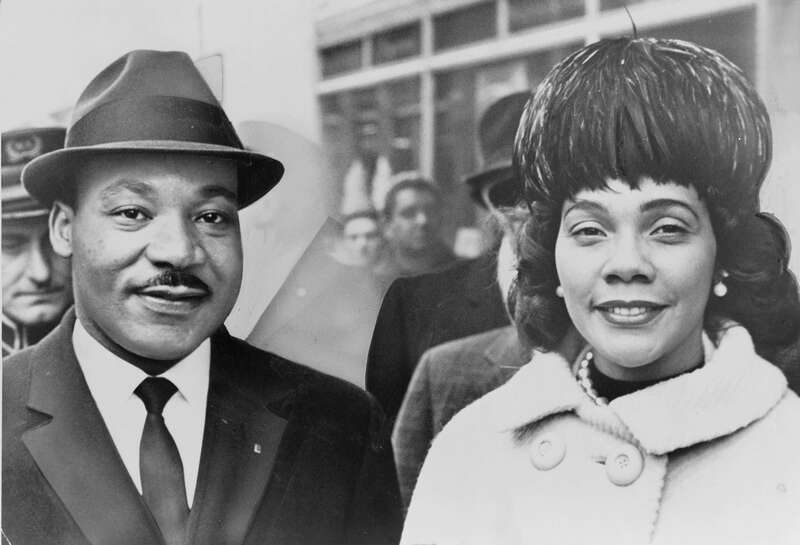 King led a mile-long line of determined marchers, 22,000 strong, to the Boston Common. They sang freedom songs on the 2-1/2 mile -walk along Columbus Ave. When they reached the Common, King delivered a speech from memory in the drizzling rain. Hasan Sharif remembered his plea for the demonstrators to be agents of change instead of leading lives of passive acceptance. 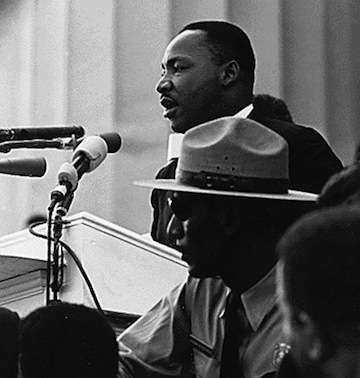 “Now is the time to make real the promise of democracy,” King declared, “Now is the time!